Aside from Charlie Brown, Peppermint Patty is the most well-thought out, deeply characterized member of the Peanuts gang. Charles Schulz told some heartbreaking stories about unrequited love, single parenthood, gender norms, and deep-seated insecurities—themes that did not normally appear on the Sunday funnies page. With unique characterization that helped her gain the audience’s sympathy and trust, Peppermint Patty was usually the delivery person of those themes. Politics are rarely palatable in comic strips. Doonesbury has always been criticized for politicizing the funny pages; nervous editors would sometimes move it to the editorial pages instead. The same thing happened to Mallard Fillmore and The Boondocks. But Peanuts, perhaps because of its longevity and its ‘slice of Americana’ public image, got away with making political statements all the time. Through the everyday experiences and perspectives of children, Peanuts was uniquely situated to address the issues of the time. In an interview with The Herald in 1987, Charles Schulz described the process by which he conceived of Peppermint Patty. Schulz believed that creating a new character simply because ‘it was time’ would be a fatal error—it needed to happen organically. While Schulz was walking through his living room, he noticed a dish of peppermint sweets. He thought it would make a wonderful name for a character, and he drew a face to match the name. Everything snowballed from there, and Peppermint Patty made her debut on August 22, 1966. This single interaction does an incredible job of characterizing Peppermint Patty. The colloquialism of her first line—“Who you writin’ to?”—shows a level of casual forwardness that belies someone of her age. Everything about Peppermint Patty reads differently than the other female characters in Peanuts. This sets her apart and foreshadows the non-traditional ideals she advocates for. She’s a jock (superior to her boy companions), with a short, practical haircut and freckles. She wears a striped t-shirt and shorts; the other girls in the strip, such as Violet, Lucy, and Frieda, all wear dresses. She’s the only character who wears open toed sandals. Peppermint Patty’s entire story and characterization unfold over decades, in a way that feels natural and unforced. Schulz didn’t rap readers over the head with her issues, nor did he confine them to a single week of strips. They were simply a part of her. To convey complex ideas, Schulz needed a complex character. One of the most important people in Peppermint Patty’s life is her father, who raised her by himself. Jean Schulz, Charles Schulz’s widow, has a blog, on which she recently revealed that Peppermint Patty falls asleep in school because she stays up late, waiting for her father to come home from work. We get every indication that the mother is dead (the strip never clarifies it definitively), and Peppermint Patty and her father share a close, loving relationship. Like all adults in Peanuts, the father is never a physical character. But we learn a lot about him based upon how he dotes upon his daughter. In one series of strips, Peppermint Patty fights her school’s dress code, which mandates that she wear shoes instead of sandals—an issue that still has relevance today. Resisting against the establishment is a common Peppermint Patty plot, made easier by her non-traditional clothes. A different storyline, for example, forces her to wear a dress to school, which she deals with in her characteristic outward manner. But the sandals storyline is more than using a character to represent an issue. Peppermint Patty isn’t merely angry or indignant; she’s sad. We learn that the sandals have a personal meaning. Her father gave them to her, and she wears them in recognition of his love. The personal and the political combine through her storyline. Peppermint Patty has a weary worldliness about her, an acute awareness of the adults who affect her life that is not seen in other Peanuts characters. Characters such as Lucy and Schroeder have no use for adults; they have that luxury. But Peppermint Patty holds onto and repeats her father-given nickname, “a rare gem,” like a defensive shield. It’s a way to remind herself that someone loves her for exactly who she is: tomboyishness, big nose, split ends, and all. In this Sunday strip from 1982, Peppermint Patty tries to buy a Mother’s Day card for her father because he serves both parental roles in her life. It’s a non-sentimental look at a complex issue. It’s told from a child’s point of view; the fact that ‘they’re just kids’ is one of Peanuts’ greatest strengths. This issue, like all Peppermint Patty’s struggles, is addressed with her characteristic, disarming bluntness combined with her youthful idealism and naïveté. Peppermint Patty’s worldliness manifests itself through her particular activism. The strip has been celebrated, in many different venues, for being an understated advocate for second wave feminist issues. There’s something admirable about Peppermint Patty’s insistence and stubbornness despite token support from her peers. For example, Marcie declines to support women’s sports on the grounds that she doesn’t like sports. When Peppermint Patty counters with the larger issue—that it would be a win for women’s rights—Marcie retorts, “I’m not a woman yet either.” It’s an identifiable frustration for any advocate: to get people on board with an issue that doesn’t immediately affect them. Of course, none of these agitations lead to any meaningful change. So much of Peanuts is characters following their passions and meeting disappointment, only to pick themselves up and try again. But these issues are always portrayed as principles worth fighting for, despite the outcome. Peppermint Patty also addresses feminist issues in the personal sphere. One of Peppermint Patty’s most notable frustrations is her unrequited crush on Charlie Brown. For much of the early 70’s, Peppermint Patty attempts (and fails) to express her feelings to “Chuck,” usually underneath a large, contemplative tree. These tree conversations are opportunities for both characters to wax philosophical (not unlike Calvin and Hobbes’s wagon rides). Peppermint Patty doesn’t need a Violet or a Lucy to tell her where she belongs in the social hierarchy. She is hardest on herself, in a way that is heartbreaking and undeserved. She is not an ideal advocate for herself. Yes, she rebels against gender roles. But that doesn’t mean that she’s immune to their effects, or to her own insecurities. It’s difficult to imagine another comic strip character, in Peanuts or beyond, delivering the same monologue with the same raw feeling. Mercifully to Peppermint Patty, Schulz pulls his punch, and ends this series of strips on a sweet, optimistic note. Much of the pain in Peanuts is abstract, derived from things that don’t happen rather than things that do. 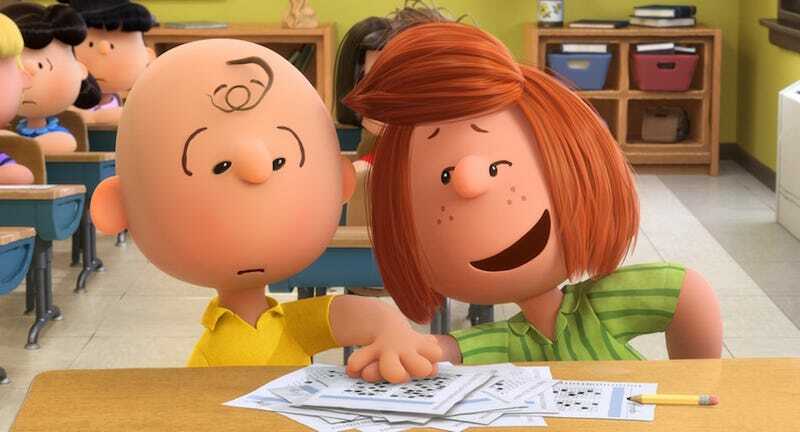 Charlie Brown’s deepest pain is that he’ll never get the courage to approach the Little Red-Haired Girl and experience affection. Linus’ deepest pain is that he’ll never meet the Great Pumpkin and have his crisis of faith resolved. But Peppermint Patty’s deepest pain is being rejected and demeaned in the here and now. Her activism is ultimately centered on the real, immediate struggles of a child, one who is complex, tough, brash, and sensitive. By setting her apart and using her to both experience and educate on complex political issues, Schulz made Peppermint Patty a rare gem in the Peanuts universe and in the comics universe beyond.